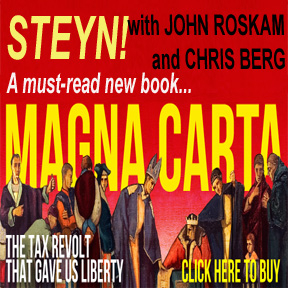 Steyn said the ongoing events are an example of the "permanent bureaucracy and the courts ganging up to cripple the executive branch." "He could ban all Canadians by proclamation," he said. 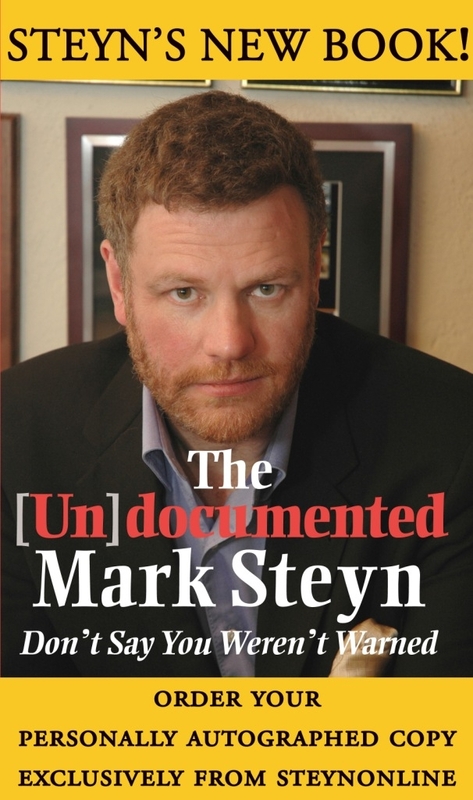 If you like Mark in video, he'll be back with a brand new SteynPost tomorrow. On the other hand, if you prefer Mark in non-video, he'll be back on the radio with the great John Oakley at AM640 Toronto on Wednesday afternoon at 5pm Eastern. 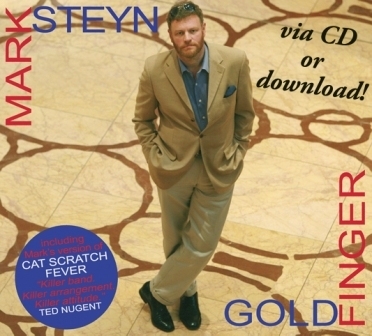 SteynPosts and much of our other content is made possible through the support of members of The Mark Steyn Club, for which we are profoundly grateful. 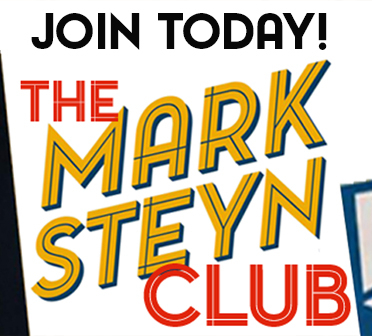 What is the Mark Steyn Club? 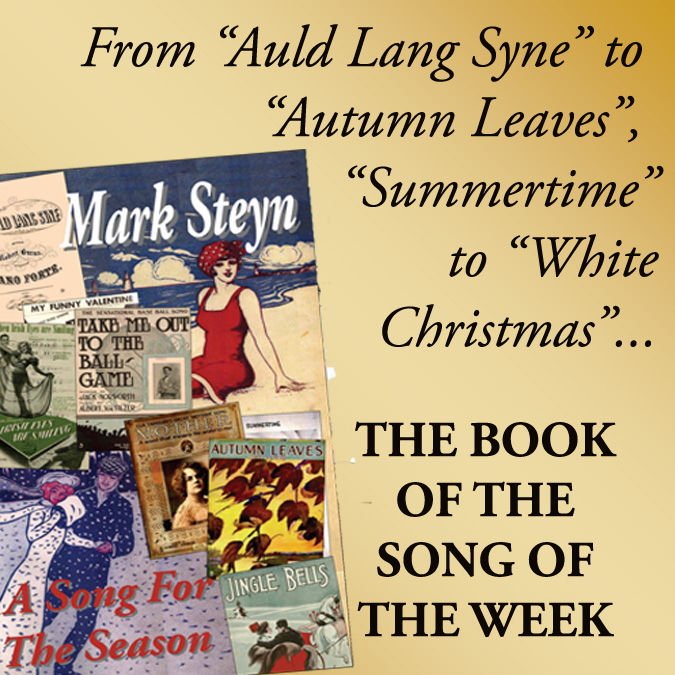 Well, it's an Audio Book of the Month Club - or, if you prefer, a radio-serial club (a special seasonal edition thereof starts this weekend). 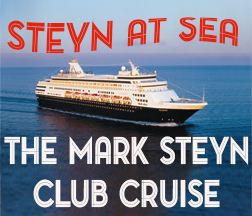 The Steyn Club is also a discussion group of lively people around the world on the great questions of our time. It's a video poetry and live music club. We don't (yet) have a clubhouse, but we do have a newsletter and other benefits. 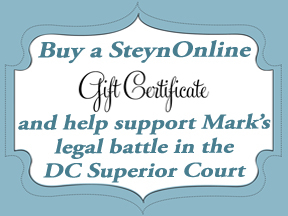 And, if you've got some kith or kin who might like the sound of all that and more, for this holiday season only we have a special Christmas Gift Membership that includes a welcome gift of a handsome Steyn hardback or a CD set personally autographed by Mark. More details here. If you, or any commenter, could explain to me how the checks and balances in the American governmental design are being circumvented and corrupted by the permanent bureaucracy and the Democrats I'd be grateful. Correcting this situation is essential for America's survival. Trump was hired (elected) by The People, to drain the Swamp and get the country back on course. If he is prevented from doing this by the Swamp, perhaps the People will, after a period of unrest, drain the Swamp themselves physically and violently (Coup d'etat? ), and re-boot it from the Constitution. Once again, Mark hits the nail squarely on the head. After the egomaniacal politicians taking up space on Capitol Hill. the Permanent Bureaucracy is the real problem in Washington. 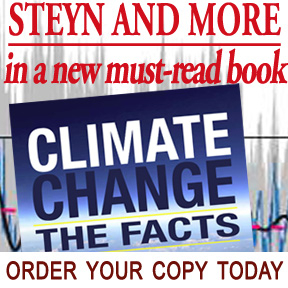 Thousands of unvoted-upon rules are made every year by hundreds of federal agencies. Most of the rules demand fines and fees from American taxpayers. Yet not a single congressman or cabinet official reads ANY of them before they are announced. According to the constitution, only Congress can pass laws. The bureaucrats do the same thing; but they call them "regulations". The Permanent Bureaucracy is expertly explained in the eye-opening book "Bureaucratic Bombs". Correct me if I'm wrong, but there's nowhere else one can go to hear it put this way. At this taping it wasn't even yet reported that senior FBI "investigators" were in Hillary's - or Obama's - pocket. I am sure that Mark will recall the famous observation made about the British House of Lords early in the 20th Century.. After Arthur Balfour's Conservative government was badly defeated in 1905, Balfour used the traditional (but rarely used) powers of the House of Lords to block reformist legislation proposed by the new Liberal governments of Henry Campbell-Bannerman and then H.H. Asquith. David Lloyd George, the most fiery of the reformers, noted that the Lords were somnolent during periods of Conservative power but snarlingly active whenever the Liberals were in office. He referred to the Lords as "Mr. Balfour's Poodle." The 1911 Parliament Act was passed to finally and officially make the House of Commons the primary lawmakers of Great Britain. The media and the entrenched "permanent bureaucratic state" may well be referred to as "The Democrats Pet Pit Bull" since they are all peaches-and-cream during Democratic administrations and rabidly aggressive when the GOP happens to be in the majority. Unfortunately it will take more than a mere Parliament Act to curb the immense and increasingly sinister power of the federal bureaucracy. Well said John, a succinct summary. Wow, Mark is absolutely right. I had no idea the law was so clear, but there it is just as he quotes it under 8 U.S. Code § 1182 - Inadmissible aliens, section (f) Suspension of entry or imposition of restrictions by President. It's clear as can be the president has the right to do this, yet two Supreme Court justices still dissented. 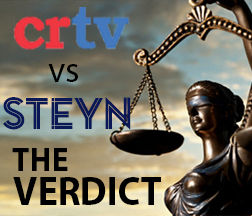 The two dissenting supremes represent the beginning of the end of the American experiment. When most cases are decided by five legal experts deciding one way and four other legal experts deciding exactly the opposite based on the same facts and law, it's clear that even the blind justice we've been told to trust is driven by crass politics. Integrity is nearly gone. It's all about power and politics. I am afraid, you're wrong - it's worse than you see it. In reality, it's not that four vote one way and four the other way (with the ninth switching back and forth). It's that four vote one and only one way always, and the other four vote based on the merit of the case. The crass politics (in terms of policies, not necessarily in terms of personal empowerment of individuals) is only applied for the benefit, or more precisely goals, of only one of the parties. No Ivan, I think David is right. If you have, let's say 8, legal experts and four decide one way and four decide the other way, what that says is that the law is essentially a Rorschach test. We can't last as a country where it comes down to what the definition of "is" is. Mark and Tucker almost point out the real problem -- what we have is a kritarchy, we are ruled by judges. The three branches of Federal government are separate but not equal. In fact, one has "supreme" in its very title. The people can overwhelmingly favor something, Congress can pass it as a law and the President can sign it, and one judge (as the swing vote on the Supreme Court) can say, "nope, we're not doing that" and he or she wins. That is the state of affairs we find ourselves in and it is a very dangerous state indeed. Sorry if I didn't express myself clearly. I don't dispute that two sets of lawyers deciding the same case fundamentally differently from each other is a major problem by itself. What I do dispute is that there is no integrity. There is way too much integrity on the part of the traditional constitutionalists, given the blatant unscrupulous ideological partisanship on the part of the living-documentists. And that the situation is not that of partisan decisions cancelling or neutralizing each other, but piling on on only one side of the ledger. It doesn't take four+one judges on the SC; any one single excentric judge in some obscure local jurisdiction can effectively veto the laws and executive orders for all of the country. Only temporarily maybe, but the temporarity can become pretty prolonged. It can stretch over an entire term of elected official, in the hope that there will be a new president who might actually cancel the policy protested against. I don't know when I first noticed this but a good sign that the judiciary has turned into a crapshoot (as if more evidence is needed) comes from listening to the talking heads on the media discussing how a federal court might rule. They spend most of their time discussing the justices' political leanings and which president appointed them. Very little is said about the law in question. I wonder, has America faced this type of challenge to it's governmental design in the past 200 years? I'm hoping the fundamentals are so strong, the American experiment will survive. The Civil War was an exceptional challenge, and we overcame that with considerable effort and expense. There are always some who wish the design was different., and some who will fight to obtain their preference. As with most disputes in human interactions, some compromises are necessary to minimize the violence that is always the ultimate arbiter. It's a much different country than it was in the 1860s, and will be even more different in another century and a half. Maybe with less violence. Maybe not. Integrity is entirely gone. It's been all about power and politics since Woodrow Wilson. America's governing system has weathered a lot over 250 years, I think because the Founders got the fundamentals right. The corrosion has been slow, like rust on a great ship, and hence not visible above the surface. Now it is has become so bad the ship is listing to port, but its not sinking - yet. America is a country that fundamentally believes in law and order and the power of the People to determine who they want to govern, and will not tolerate a level of corruption that takes that power from them. If Trump is prevented from cleaning house and draining the swamp, I think eventually The People will. America wasn't monolithic at its inception, or since. We've always had a minority who wanted to change things, until they become a majority and accomplish some changes, whereupon they ebb into minority status again. Past changes get undone, new changes are created. The differences seldom become overtly violent, but conflict is ever present. The best solution is always education. It's always the ignorant who cause the trouble. These days we have a lot of people educated in the wrong things, and ignorant of what matters. We can fix that. But Holly, how exactly will The People do that? I was inferring the People will do it forcefully and violently if necessary. Not sure where the military would stand in that situation. Power usually has to be wrested by force or credible threat of consequences. IMHO, American's won't tolerate devolving into a Banana Republic. It never has been and never will be. Yes, but how do you educate the right things, when the media is colluding with the Swamp, the Democrats, the Environmentalists, the Globalists, and the Totalitarians? If it was easy we wouldn't be in this predicament. As Churchill observed, Americans will always do the right thing after exhausting all the alternatives. We'll get it right eventually. It would be quicker if they just put me in charge, but I don't have time right now. 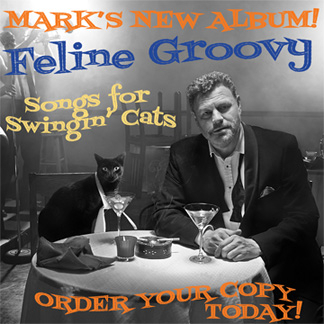 The solution for the media is, of course, Mark. He doesn't seem to collude with any of those people, and is effective at identifying their errors. I thought that was where you were going, but beware. You speak of Americans as if they are united. In fact, they are very divided and about half are rooting for a Banana Republic, as long as they get some bananas. About half of Americans (or Canadians) have their heads in the clouds, looking for unicorns and rainbows, whilst slipping on bananas; the other half have their feet firmly on the ground. In the end, it isn't reason that brings people to their senses, its economics. Feeling superior and criticising Western Society is cool and everything, but everyone wants to be home by dinnertime, in their nice home, with the nice car parked in the driveway, and 60 inch TV. The repulsive seat-dance of that wealthy, pampered ignorant woman on The View in her little grotesque theatre celebrating that the elusive 'silver bullet' had been found at last, as if it's some little game. It brought to mind instantly in year 2000 our neighbor watching Ivorians dancing about and cheering that their president, Bedie (after a decade in power) had been abruptly ousted. 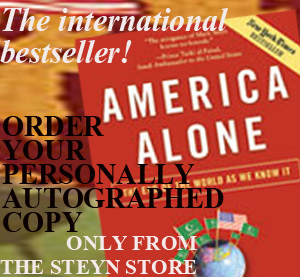 She, an exiled Liberian from the civil war, shook her head bitterly and said, "They're fools. We all danced too in Liberia at the time. We learned the hard way. They have no idea what is coming on their heads." And true to chaos and war, women suffered horribly. Who do people want in charge? The vicious morons who think it's fun to pull the pins from the tracks to cause a train wreck or sane and sober people who understand how many innocent people get hurt and killed and how much property is irrevocably destroyed by such 'simple' acts ? Thank you Mark, as always, for a meaningful, helpful analysis for readers and Fox watchers. Trump is holding strong, and slowly winning over the Executive Branch and SCOTUS by never backing down or compromising on his oft-spoken views. He will keep gaining respect and backers I think/hope, both at home and abroad. He calls a 'spade a spade'. He deals with the world as it actually is and is a man of the people and a steadfast believer in the American Constitution, and it's limits on power to prevent Tyranny. Why the Democrats have abandoned the Constitution I don't understand. Just for power? Commentors often bemoan how the American public are dupes and easily swayed. But I don't think one should underestimate the wisdom of American Citizens and their ability to see through the morass of corruption that is the DC Swamp. They elected Trump. And if Trump is removed from power by the democrats before his term is up, we may witness the next American Revolution, in which American citizens physically and violently clear out the government in DC and re-boot it from the American Constitution. If that happens, we certainly already have our laundry list of grievances. It's growing by the minute. Our focus next is to keep the House from turning back to the Dems. If the Democrats pick up about 23 Republican seats, they would take back the House and Pelosi would be Speaker again. The historical trend for mid-terms in the last fifty years after a new President takes office is about a 35 to 40 seat loss. Fortunately, Trump won most of the Republican controlled districts so we should be alright. Hopefully the historical trend for mid-terms will not materialize. Trump, as an outsider, and a strong leader, who isn't afraid to call out the corruption of the Swamp, is shaking things up a lot. He is counselled to tread carefully in the Swamp; but I believe his personality and his leadership style are his strengths, not his weaknesses. The whole saga of his Presidency reminds me of the The Lord of the Ring Trilogy. It is extremely dangerous, almost hopeless, but Trump must confront the evil himself, and he is the main target of the Swamp and it's Orc army (the media and the permanent bureauocracy) , because he has the sense of duty and the "ring" (the Presidency). He has said he was considering running for the Presidency for decades, but he didn't want to. He finally decided he had to. Hence, Frodo has set off on his perilous journey. You won't get any argument from me. I love this analogy to The Lord of the Ring Trilogy with regards to the current state of affairs in DC. I do think we're seeing dark forces at work and the worse the news gets, the more things don't seem to change. I wish I thought of it first. Drats! Yes, I too love the analogy. However, a few points. Seeing Trump as a humble, unassuming Hobbit is a bit of a stretch, LOL. More to the point, ultimately Frodo was overwhelmed and succumbed to the power of the Ring. We don't want that with Trump! Also, in some ways we conservatives are like Hobbits. That is why we aren't often seen out in the streets protesting and rioting at the drop of a hat. We prefer to be left alone to live our lives. But then, in the books, the Hobbits did let the Shire be taken over by Saruman. Perhaps we will only be saved when Hillary sneaks up behind Trump and bites his finger off, LOL. human history ( Romans, Christians, Muslims, Germany, to name a few). Conservatives are common sense people who live in the real world and deal with politcal problems pragmatically, like Hobbits, not from a mindset of Hatred of Humanity that drives leftist agendas. And yes, Hillary has indeed decended to the level of Gollum, but perhpas is more like Saruman? Seeking the ring to consolidate power over the Shire and the human race? Probably shouldn't get me started on LOTR, Holly. However I do have to laugh at Hillary as Gollum. It does fit. Trump has her Presci, er, Presidency and she can't stand it. In fact, if you listen closely to her coughing fits during the campaign, you can hear her making the "gollum, gollum" sound. No you're right Steven. Hillary is more like Gollum, with the Presidency being her Precious. Merkel is Saruman. I've been binge-watching Season 3 of The Blacklist on Netflix, and it is disturbingly, 1980's-Tom-Clancy levels of prescient. A secret Cabal embedded in the highest levels of the US government, dedicated to creating a new Cold War and increasing geopolitical instability so its members can profit handsomely? Ha ha! So Alex Jones of you, CBS! At the moment I'm just wondering if John Bokenkamp knew something or if The Blacklist is a form of subtle disinformation strat so anyone pointing to the Deep State can be accused of believing a TV show is reality. As Tucker said at the end, that was deep analysis. It's a foreign thought to me that Americans would be offended by someone from another country offering analysis about our country, but that's just from my point of view. In terms of this subject, who better to discuss it? That's the one type of immigration that we need: insightful and intelligent people not subjected to our school system who are loyal to the new country, as my Irish ancestors were when they arrived at Ellis Island, who bring valuable outside perspectives. Being right in the thick of things, and not known for having the broadest grasp of history, Americans are subject to the whims of the day and largely unequipped to resist the appearances out of nowhere of notions that the executive branch can be summarily deprived of executive authority. A news article appeared a couple days ago called "New Zealand Seen as Switzerland of Property." The subheadline beneath it said, "Isolation from geopolitical turmoil is helping to drive overseas investment." That's one mention of isolation. Two more in the first paragraph: "New Zealand's isolation has become one of its biggest assets as offshore investors look to buy real estate in a stable economy isolated from tumultuous world events, says investment property specialist Simon Felton." The article returns to the theme: "Geographic isolation from world events, rich natural resources and a relatively stable geopolitical environment have meant that New Zealand is an attractive place to invest for the global market." Followed by: "While North Korea, Trump and Brexit have loomed large in the headlines this year, New Zealand has been relatively insulated from the world's turmoil." The article ends succinctly, "New Zealand's isolation has become one of our biggest assets." New Zealand could override this with planes, but doesn't. Are Kiwis racist, or just prudent? Once again another mini-coup against the people has taken place. The Supreme Court should have ruled out right that this ban was in the president's power, instead of sending it to the lower courts. It is getting hard not to believe the conspiracy theorists; everyday there is more evidence that the game/system is rigged against the American people. This will not end well for our country. Hopefully there will be a new spark of liberty or it will truly be a dark period. The Washington Post and others in media are turning out the lights, so that democracy will die in the darkness. I think a better formulation would be to state that the Left, the permanent bureaucracy, whatever believe that the Executive and Legislative are only empowered to do that which the Left, the permanent bureaucracy, etc. approve of. In that way, we are really talking about a repeal of democracy. On that note, I caught an interesting piece by Dinesh D'Souza about Giovanni Gentile and the origins of Fascism. It was interesting to read about the concept of "true democracy" as understood by Fascists. 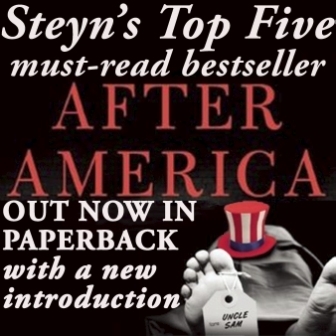 Any chance of a SteynPost with Mr. D'Souza to explore the topic? 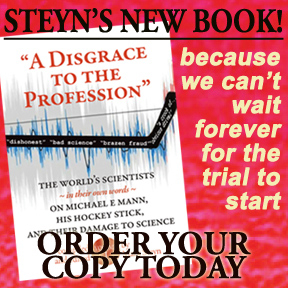 My apologies, Mr. Steyn. I forgot to remark on the fact that it's another excellent analysis. I saw another commentator on here the other day mention that D.C. has only about 5% Republican voters. Is this true? Do Federal civil servants have to take an oath of impartiality? If not, then they should and that would give grounds for dismissal if they break that oath. Hope you don't mind us jumping in on this, most middle class/upper-middle class government employees live outside DC and commute in over the line from either Maryland or Virginia. Their votes show up in the commuting neighborhoods of those states. So at night, after the mass of day workers leave, in a grand generality, the DC voters are roughly 1/4 - the NW enclave - of white wealthy private and public professionals (heavily-lean Democrat), and the rest, roughly 3/4 of the sections are mostly mid to lower income Black neighborhoods, some heavily public housing with crime problems (completely-lean-and-fall-over Democrat). Impartiality is not required of any citizen. It's assumed for judges, but we all know that's a myth, too. Civil service employees are predominantly Democrat because they're predominantly unionized, so supporting Democrats is in their self interest. Requiring impartiality of an employee is quite a different matter from requiring it of a citizen. Performing the duties that your employer has hired you to do and keeping your personal politics out of the matter should be basic terms of employment. Imagine if everyone in the medical profession worked on implementing their personal politics on every patient. There's a somewhat recent news story that has this issue in it, and I'll follow up if it comes to me before my next pint does. If it's after that then it's probably better if I recuse myself from comments until tomorrow. There is the Hatch Act of 1939. As someone who has worked for a branch of a state government for nearly thirty-five years and having had discussions on the matter with other state's employees over the decades, I can tell you that state employees tend to have less restrictions on their political activity, but they do certainly exist. What you find on the state, county, and local level is a situation where those in Power And Control of a particular branch of government do not look favorably on those who hold opposing views and who advocate publicly for their side [usually the conservative or libertarian side]. While going after unionized employees is harder, it is done on a more subtle level, whereas someone such as myself, a Senior Manager, can be fired more easily. Requiring impartiality is easier than expecting it. One thing we can reliably expect is all employees will follow their nature, regardless of requirements. Human nature makes us selfish and demanding, some more than others. Fortunately, most people are less interested in imposing their politics than in doing their job. But there are always a few who let their ego dominate their actions. I thought it was Canadian Bagpipers that were supposed to be banned. Now it's tap dancers too? Next thing you know they'll be banning Canadian hockey players. What they really should do is ban the class of Canadians known as Trudeau.